Jerusalem is the center and birthplace of Christianity, as it is the spiritual home of Judaism and Islam. These three faiths peg their origins to Abraham, the supposed historical father of Islam and Judaism, and spiritual father of Christians. Pilgrims from all over the world come to Jerusalem. Although pilgrimages are not as important for Christians as they are for Muslims, thousands of Christians make their way to Jerusalem every year, specifically to the Church of the Holy Sepulchre. Located in the Christian Quarter of Jerusalem’s Old City, the Church of the Holy Sepulchre is considered by many as the most important cathedral of all Christianity, even more spirituality significant than those found in Rome. This is largely because several biblical landmarks are found within the church premises. These extremely important landmarks include where Jesus was crucified, buried and resurrected, which are three New Testament events that make up the very foundations of Christianity. 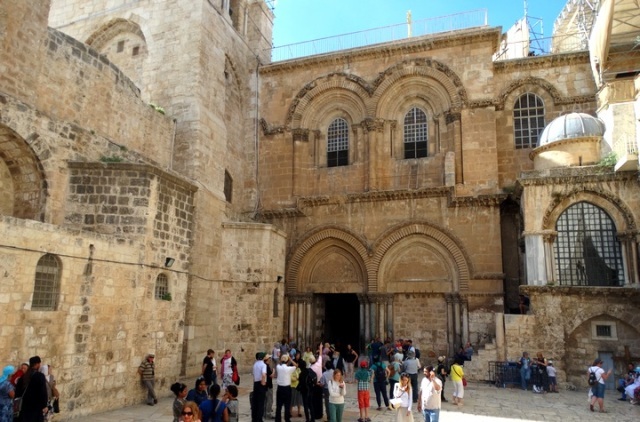 Pilgrims, both for religious and academic purposes, begin their tour to the church following the Via Dolorosa (The Way of Grief), or the path that Jesus took going to his crucifixion. This is also popularly called Stations of the Cross in Roman Catholic tradition. The first and second stations are located in the northeast corner of the Old City. The sites are marked by three Roman Catholic churches, which are the Church of the Condemnation and Imposition of the Cross, Church of the Flagellation, and Church of Ecce Homo. The next three stations pertain to where Jesus fell three times while marching to his death. Today, the spots are marked by the Polish Catholic Chapel, the second is near a Franciscan chapel and the third is at the entrance of the Ethiopian Orthodox Monastery and Coptic Orthodox Monastery, making this station not officially part of the Via Dolorosa anymore. The next stations are where Christ supposedly met with the Virgin Mary, Simon of Cyrene, Veronica and the pious women along the way, and the final stations are found within the Church of the Holy Sepulchre. The ultimate end is at Calvary and then the sepulcher. Inside the church to the southern portion of the altar is Golgotha, according to traditional claims. Kept inside protective glass is a rock with a hole, in which the cross was supposedly made to stand. Not far away is a cave that tradition points to as the Holy Sepulchre. Experts, archeologists and non-Catholics have questioned the authenticity of these holy sites inside one sprawling Roman Catholic church. Protestants, for example, have identified a cliff outside the city walls bearing the marks of a skull to suggest that this may have been the real Golgotha. This alternative site is called Gordon’s Golgotha, pertaining to General Charles Gordon who first identified the place. Not far away is also an alternative site for the Holy Sepulchre. It is called the Garden Tomb, which is also a major tourist destination in Jerusalem. It is located outside Jerusalem’s walls. Meanwhile, there are other important religious sites within the Church of the Holy Sepulchre, which truly makes it a must-see structure. These attractions are the Chapel of Adam, Stone of Anointing, Angel’s Stone, and the Chapel of the Nailing of the Cross, among many others.